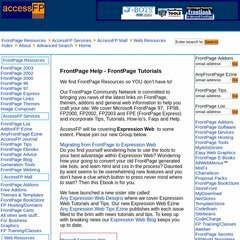 accessfp.net FrontPage Resources - FrontPage 2002, 2000, 98, 97, FrontPage ..
accessfp.net Publishing with Frontpage 2002, Choosing a domain, Finding a host ..
accessfp.net FrontPage 2002 Tutorial - How to maintain your FrontPage Website .. The estimated 538 daily visitors, each view 1.20 pages on average. welshchapelsandchurche.. Croeso/Welcome to Welsh Chapels & Churches- A website of ..
ns1.bluehost.com, and ns2.bluehost.com are its DNS Nameservers. It is hosted by Bluehost Inc (Utah, Provo,) using Apache web server. Accessfp.net's server IP number is 66.147.242.186. Website load time is 2406 milliseconds, less than 47% of other measured websites.